The end of the year is coming up soon and that often means cleaning out junk, some of which is e-waste. Electronic equipment continually improves and evolves with the advances of technology. As a result, most office equipment is upgraded regularly, sometimes even annually. However, what ends up happening in many businesses and offices is that their old devices often end up no longer being used and simply collect dust in some storage room or empty office. All of these old devices and pieces of electronic equipment are what is referred to as e-waste, or electronic waste, and they requires special consideration when being disposed of. If you consider your offices right now, how many printers, computer monitors and old CPUs have been out of commission for over a year now? If you counted a few or more, it’s a good time to get rid of those e-waste items. But this brings up the question: "What do you do with all of it?" E-waste is a popular, informal name for electronic products nearing the end of their "useful life." Computers, televisions, VCRs, stereos, copiers, and fax machines are common electronic products. Many of these products can be reused, refurbished, or recycled. With the passage of the Electronic Waste Recycling Act of 2003, certain portions of the electronic waste stream are defined and the systems to recover and recycle them will be administratively regulated beyond the universal waste rules that apply to material handling. Unfortunately, for consumers, there are a number of environmental and legal issues with e-waste disposal. There are a number of laws and regulations, especially in states such as California, which mandate that many items such as monitors, TVs, and even cell phones cannot be simply tossed in the trash. Certain components of some electronic products contain materials that render them hazardous, depending on their condition and density. For instance, California law currently views nonfunctioning CRTs (cathode ray tubes) from televisions and monitors as hazardous. Because of the requirements in place for properly disposing of a computer monitor, for example, the process takes time, effort and money. This creates a burden for many businesses since they often have large quantities of older electronics and, subsequently, far more amounts of e-waste than a typical individual or family. An old monitor or VCR cannot be placed in a commercial dumpster behind an office complex or manufacturing shop any more than they can be put in the household trash. Because of the many regulations restrictions and added fees involved in recycling e-waste, it may tempting to simply throw out your old electronics anyway. But, aside from being illegal, it also ignores the bigger problem with e- waste, which is that it contains toxic materials that are hazardous both to the environment and to human health. As a nation we haven't done to well with e-waste recycling historically. The data for 2015 and 2016 are not available yet. According to the EPA, only about 1 million tons of over 3.4 million tons of e-waste generated in the U.S. in 2012 was recycled, resulting in a recycling rate of 29 percent. The e-waste recycling rate in 2011 was 24.9 percent, and 19.6 percent in 2010. While we are, as a whole, getting better at reducing the amount of e-waste going into landfills, there is still much more to do. If we are currently generating over 3.5 million tons of e-waste - which is probably too conservative a number - and we have achieved a recycling rate of around 35 percent, that still means over one million tons of e-waste goes to landfills. Unfortunately, recycling e-waste yourself can be a much more difficult and complicated task than anticipated. This is largely because of the various laws, fees, and restrictions that people run up against. But that's not the only issue that prevents proper e-waste recycling. 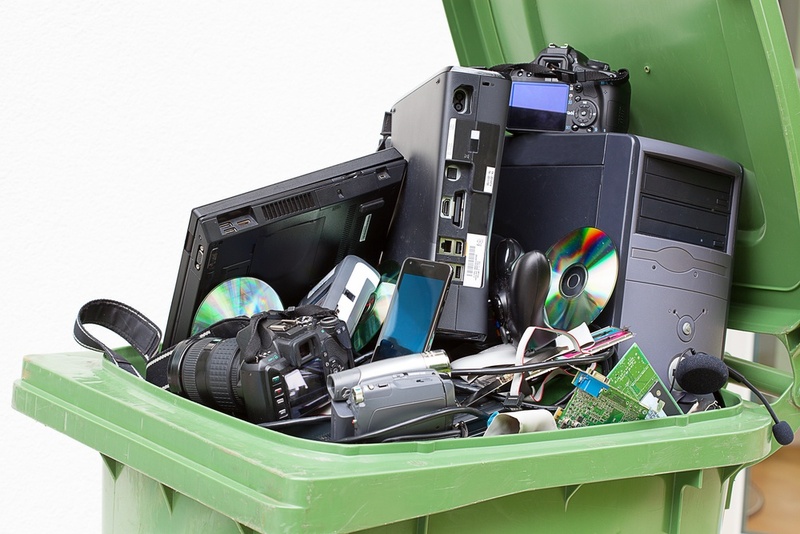 Another problem is that far too many people still do not realize they actually can recycle 100 percent of the junk electronic items they need to be gotten rid of. In fact, a survey by the Institute of Scrap Recycling Industries (ISRI), revealed that more than 100 million Americans adults must figure out for themselves what can and cannot be recycled and where to find information about the recycling process. This represents 44 percent of the adult U.S. population. Fortunately, much of what may not seem to be reusable or recyclable actually is. And when it comes to electronics, recycling is still the best disposal solution. And this is true for businesses as well. Once you have made the strategic decision to professionally dispose of all the accumulated electronics, devices and equipment in your offices, what's your next step? Simply call a professional business junk hauling firm and Junk King is a great choice for this task. 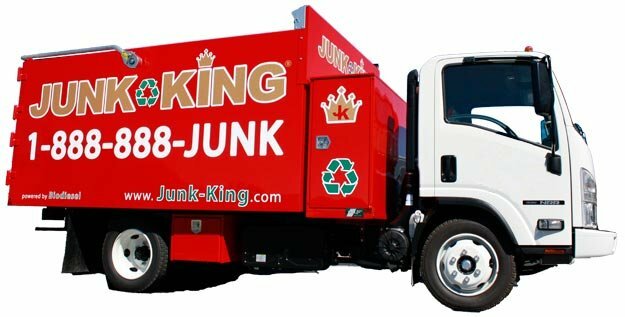 Junk King provides an efficient, safe and eco-friendly e-waste removal service so you don’t need to worry about the pick up or disposal of those old items. Not only that, but we make sure that your old electronics end up in the right place: whether it be a charity if the electronics are still functioning, or a recycling facility to ensure your e-waste is disposed of in an eco-friendly way. Learn more about our Business-to-Business junk removal services, including removing your e-waste. Our professional and insured e-waste removal team will show up at your home or office; we call 15 minutes before we arrive on site and we’ll give you a free estimate based on how much room your junk takes up in our truck. You point and we haul those items into our junk removal trucks, with no hidden fees. Make an appointment by booking online above or by calling 1.888.888.JUNK (5865).